The Senator had been hinting for months that she would back the current U.S. Attorney. The Obama administration has said that it won’t simply replace U.S. Attorneys because they were appointed by a Republican. So far, U.S. Attorney Patrick Fitzgerald of Chicago is the only Republican-appointed U.S. Attorney who has been told he can stay on for good. Letten, who enjoys a great reputation in New Orleans, would be the second Republican appointed U.S. Attorney to get the nod to stay on. NEW ORLEANS — Democratic U.S. Sen. Mary Landrieu said Monday she will recommend that President Barack Obama keep a popular Republican, Jim Letten, as the U.S. Attorney in New Orleans, a powerful patronage post that usually goes to a member of the party that holds the White House. Landrieu also announced her recommendation that Obama appoint New Orleans Civil District Court Judge Michael Bagneris to an open U.S. district judgeship in New Orleans and Louisiana State Police Lt. Col. Genevieve “Genny” May as the U.S. Marshal for the New Orleans-based federal district. But it was the Letten recommendation that was the most eagerly awaited in Louisiana political circles. 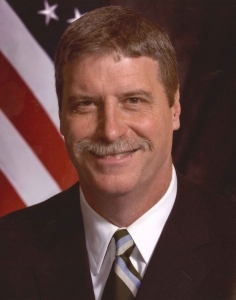 Letten gained political fame in the state when, as an assistant U.S. Attorney during the Clinton administration, he led the prosecution team that put former Louisiana Gov. Edwin Edwards in prison for corruption. After George W. Bush became president, Democrat Eddie Jordan left the U.S. attorney’s post, as often happens with a change in administrations. Letten filled the job on an interim basis then was formally appointed by Bush. Posted: 4/28/09 at 9:36 AM under News Story.